It has been a long and arduous two weeks since Lea had her knee surgery, but she finally felt well enough to attend church this morning! We have been struggling with the dizzying nausea and endless pain-induced fatigue she has been experiencing, and are now beginning to see a lot of improvement in that area. The changes Dr Miller made in her medications are having positive affects, in that she got over the dizziness and nausea within a couple of days, and was feeling pretty well when we went to see Dr Cittadine to have the staples and stitches removed from her knee late Thursday afternoon. 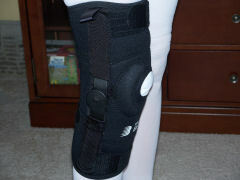 While examining her knee, however, Dr Cittadine agreed that the side-to-side movement in her artificial knee is excessive and is dangerous for her to walk with. Because her leg was so badly collapsed at the knee, he had to stretch the tendons and muscles on the outside of her leg, and surgically reposition her knee cap, resulting in an extra 2 1/2 hours of surgery. However, since the tendons and muscles on the inside of the knee were quite stretched where her leg bowed in, they are not providing any support for the knee at all. In effect, her leg is attempting to return to the shape it had prior to the surgery. This requires that she focus intently on how she holds her knee when walking, and it still will suddenly pop to one side or the other without notice. This makes the knee very unstable, and makes her apprehensive about walking. Dr Cittadine fitted her with a brace that will help keep the knee aligned as the healing process continues, which will help create muscle and tendons that will provide a healthy and stable environment for the knee in the future. Meanwhile, he prescribed four weeks of physical therapy for her, beginning next week. It is likely that she will have to wear the brace 24 x 7 for the next four to six weeks until the healing is complete, and those muscles on the sides tighten up. On the other hand, the doctor was quite pleased that she has worked on her knee flexes enough that she is ahead of schedule. She can already bend her knee over 100 degrees, and her drop foot has improved as a result. Now, she needs to continue working on getting her knee completely flat when lying down while holding her toes up. She is getting close to overcoming the effects of the dropfoot, but still needs more stretching exercise. We have finally reached the point where the pain level is sufficiently and consistently controlled by the medication, and she is experiencing only relatively short periods of pain, usually after walking. I am still giving her doses every three hours, including during the night, and am hoping she can start backing off those nighttime doses soon, so we can rest through the night. We have not been able to get out of the house nearly as much as we had hoped, because of the instability of the knee. The flexing side to side keeps the knee sore, and much of the area operated on was on the outside of the knee, so it gets irritated every time the knee pops to that side. It is strange to watch her walk, since her leg currently bends, to some extent, in all four directions. We accepted an invitation Thursday night to have dinner with our friends Pat & Joe. He advised that he is now pursuing a heart transplant, and that he will be undergoing many physical, psychological and financial evaluations within the next few months to prepare him for a transplant operation. His heart is not going to get any better, and a transplant is his best bet for returning to a normal life. Please keep Joe in your prayers. Lea thought she was feeling well enough to take over cooking a couple of the meals Friday, and hobbled around in the kitchen for a large part of the afternoon. I was glad that I wasn’t going to have to cook all the meals for a change, but knew that she would push herself too far, so, I stayed pretty close. We had hoped to get out to the Farmer’s Market this past Saturday morning, but Lea wasn’t feeling well enough to venture out after all the cooking on Friday. In fact, we spent most of the morning putting ice packs on her knee until we got her pain under control. 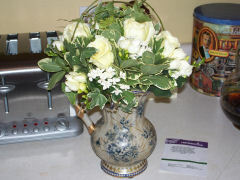 We received some lovely white roses from Lance early in the week, and she arranged them in an antique pitcher for our living room. 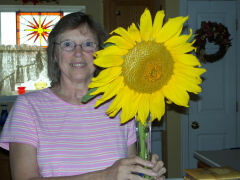 Teri and Madalynn, our neighbors, brought her a giant sunflower from their garden, too. I had to snap a shot of her standing beside it, so you could get an idea of how big it was! And, too, here’s a shot of her brace pulled up over her anti-embolism hose, which she will have to wear for about another month. Thanks for your prayers and kindnesses! Praise God for the continued healing He has provided, and for the opportunities He gives us to share our testimony!